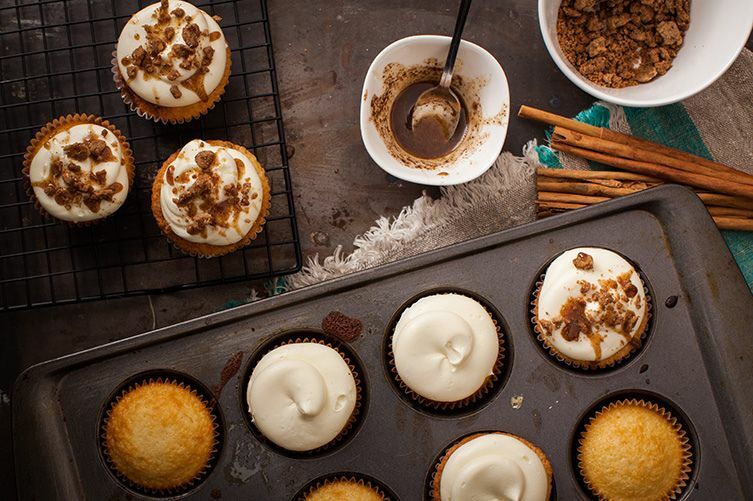 All this week, our friends Allison and Matt from Robicelli's will be sharing recipes from their cookbook Robicell's: A Love Story, with Cupcakes, hosting a Twitter chat today, answering our questions, and giving away a book every day. Today: Thanks to the Robicell's, cupcakes are now officially acceptable for breakfast consumption. What’s more comforting on a cold, rainy day than a warm, gooey cinnamon bun? Maybe curling up in a soft robe with a nice hot cup of tea, watching bad movies on Lifetime starring Valerie Bertinelli as some sort of woman “scorned.” Or lying on the couch while an entire litter of kittens sleeps peacefully on your chest. Or sitting in front of a fireplace doing crossword puzzles while listening to Sade’s smooth-as-satin voice. Okay, maybe there are a lot of things more comforting than cinnamon buns, but you know what? You can’t eat kittens or Sade, so there. The key part to any worthwhile cinnamon bun, in our opinion, is the sticky “goo” that oozes out. So rather than make just a simple cinnamon cake, we dot ours with a cinnamon sugar mixture that sinks to the bottom during baking and oozes out when you unwrap it. There’s no shame in using a knife and fork to eat this one. Pancake bacon cupcake with syrup icing. Hmm..I think a buttery sweet cupcake with a bit of cornmeal in the batter and Vermont cheddar with candided bacon and chopped smoky ham! Apple Chunk Cheddar with a streusel top! So many good choices! But I think a blueberry pancake cupcake, with either cream cheese or even a more-on-the-savory-side buttercream frosting would be divine. rhubarb and raspberry cake with lemon cream cheese frosting...please. Banana, Chocolate oat cupcake with peanut butter frosting. For breakfast, I'd have to go with zucchini or carrot. Chocolate with raspberry curd in the cupcakes with raspberry frosting & chocolate shavings! French toast with maple syurp whipped cream frosting ?.